Click here for our full web enquiry form and contact details page. Thank you! A Team member will be in touch shortly! Submit a web form, email or call us. We love details! In addition to the basics (number of attendees, proposed venue, date etc), let us know all about your delegates, event theme, run order and desired outcomes. The more details we have the better we can customise and tailor options to suit. Our quote will detail the best options for your session based on the details you provide us with and our extensive corporate event experience. If you'd like to discuss your quote the proposed session content, we're here for you! Meetings and venue inspections are also a part of our service so don't hesitate to call on us. Should your event brief change or budget become an issue, we will always do our best to tailor an option that fits. Upon receipt of your signed quotation we are able to secure your event date and provide you with a detailed, easy to follow event checklist. Much of the checklist content will have been described and discussed with you by this stage. This email will provide you with a summary of every detail pertaining to the logistics and content of the session. We pride ourselves on efficiency, accuracy and professionalism and know you'll enjoy the ease and piece of mind our process delivers. While every interactive event is different, typically our clients choose to pack even more ‘wow factor’ in and keep the session a surprise for delegates. 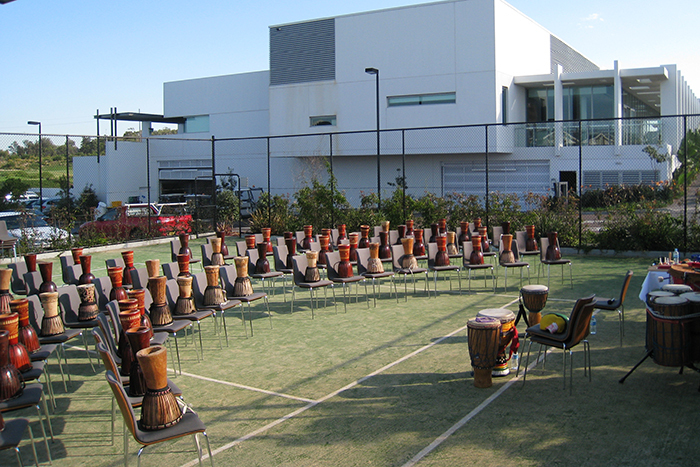 We arrive (on average) an hour prior to kick off to set up instruments and transform your event space, usually before delegates arrive or during breaks. When the entire participant group is ready to enter the event space, our team are given the signal to begin playing. Music fills the air and doors are opened. 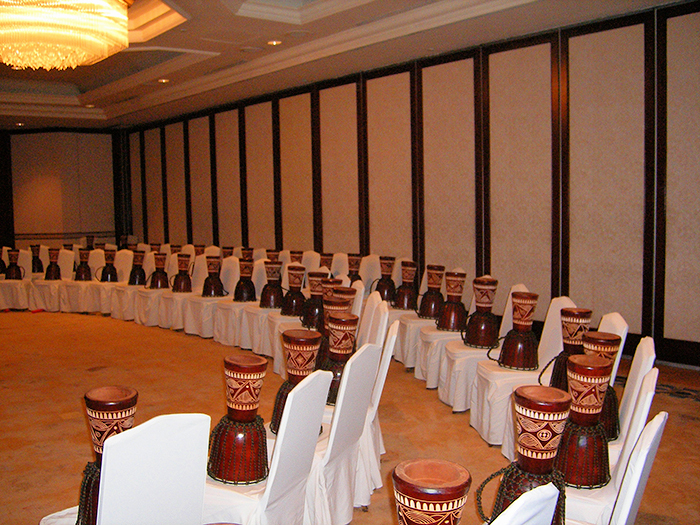 Delegates enter the room to discover musicians playing and instruments waiting on every chair. Let the fun begin! We always follow up with our clients for feedback... and of course love receiving your wonderful testimonials!! There’s no denying it – the majority of people have a certain expectancy of conferences and meetings, especially opening speeches first thing in the morning. Why not let your team’s hands be the first to do the talking? Morning kick off sessions are a fantastic way engage groups first thing in the morning and see them attentive for the important business to follow! 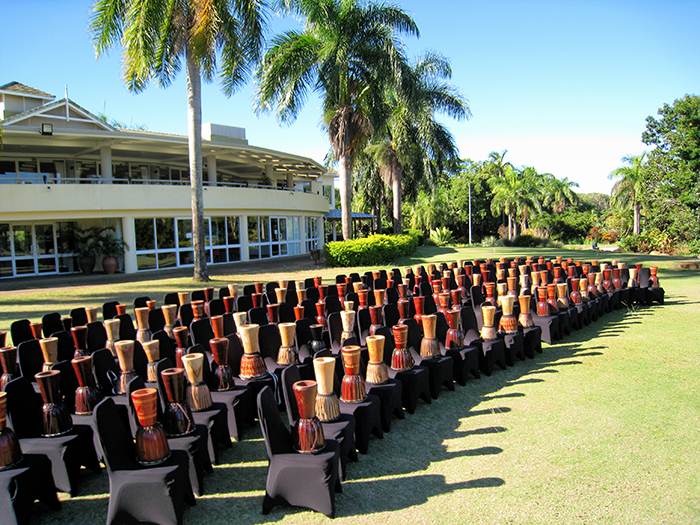 Logistically the team are able to bump in and set drums on chairs before delegates arrive. A ‘revitalizing’ session is the perfect way to keep any heads from dozing off in the afternoon! As soon as delegates break out for lunch, the team whip through your event space, with participants reentering a completely fresh and transformed environment. This serves to not only treat delegates to a well earned break, but also realigns focus and attention to make sure the afternoon is kept as productive as the morning. Any day packed with hard work and important information is important to wrap up with not only reward, but a sense of real positivity. 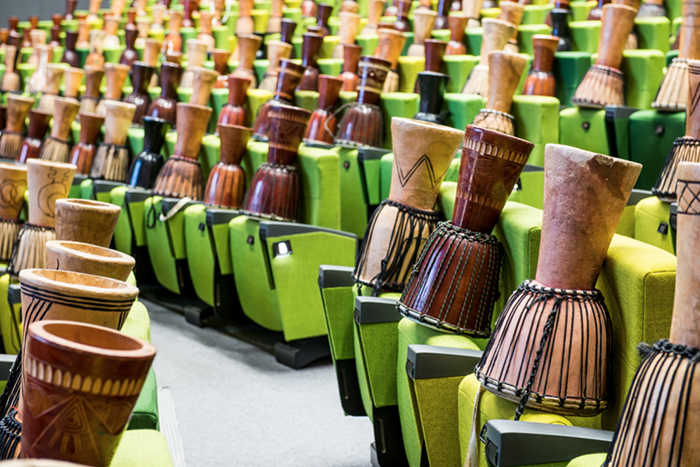 The sound of the drum not only signifies a clear ‘unwinding’ point for delegates, but also gives them a tangible means to engage with each other in a fun and memorable manner not possible through conventional conference structures. Logistically the team require a window of approximately 20 - 45 minutes (depending on group size) to set the event space. 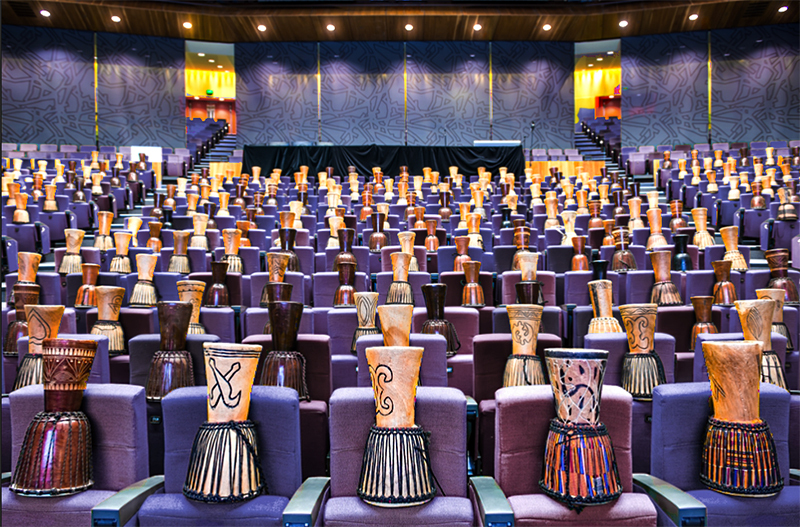 Many room configurations and event spaces are suitable for the sessions, but as a general guide sessions are best delivered to a wide (vs deep) audience/room, with no obstructions such as lecterns or pillars blocking views. It is preferred to remove instruments directly after interactive sessions. This can be achieved by delegates breaking (with pack up achievable in as little as 20 minutes depending on participant group size and assisting hands) or instruments being taken out of event spaces for quiet pack up while sessions continue. For sessions up to 80 participants in size, no AV is required. 1 x handheld vocal microphone (on a stand) is recommended for sessions of 80+ participants. 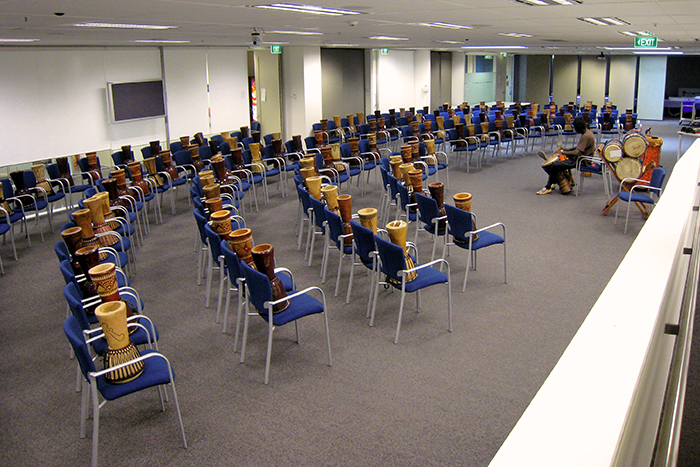 For sessions over 150 participants, 1 x percussion suitable microphone (on a stand) per performer start being recommended. Every venue and event space is different and we are more than happy to prescribe minimum requirements upon request.